•Check Out the Archive of Future Ancient Recordings on Mobile Friendly Ancient-Future.Com! 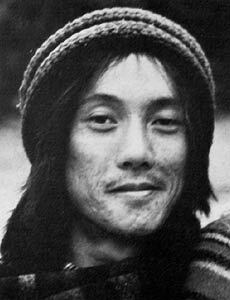 On July 18, 2016, Philip Fong passed away at St. Luke's Hospital in San Francisco after a battle with ALS. His family reported that he was courageous for the year and a half that he was hospitalized, and for most of that time he enjoyed a decent quality of life with the aid of a ventilator and speaking valve. 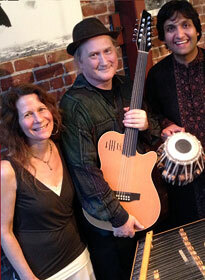 Phil Fong was an amazing musician and one of the most soulful sarod students of Ali Akbar Khan. The amount of emotion in his music was truly remarkable. But he became disenchanted with the music business only a few years after Ancient Future formed, and after leaving the band, earned a Master of Arts (M.A.) in Psychology, becoming a therapist practicing in San Francisco. No one can blame him for taking this course, and no doubt his patients are very thankful for his help. But Phil's musical legacy is important as well. He was well liked by his Ali Akbar College of Music alumni, and in addition to his work with Ancient Future, he played in a variety of other ensembles, from classical Indian music to punk rock. This video is an amazing archaeological find: the very first video of Ancient Future, recorded in late 1978, months before Ancient Future's first concert! 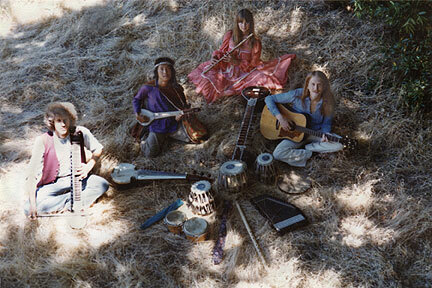 Thanks to Jonah and Mariposa at Marin Artists International who were able to rescue parts of Ancient Future's first video recording session from archival oblivion during the time that Phil was hospitalized. This short teaser from 'Eternal Embrace' by Phil Fong from Visions of a Peaceful Planet was the first release from this archeological expedition. Performances of two complete pieces featuring Phil and the rest of Ancient Future have been recovered, and are now available on the reunion E-CD edition of Visions of a Peaceful Planet. We were able to get the video to Phil's family before he passed. Friday Nights World Music at Open Secret is a music series produced and presented by Emam, who performs with each artist on the series. Tix: $20 donation at the door. No one will be turned away for lack of funds! Check Out the Archive of Future Ancient Recordings on Mobile Friendly Ancient-Future.Com! 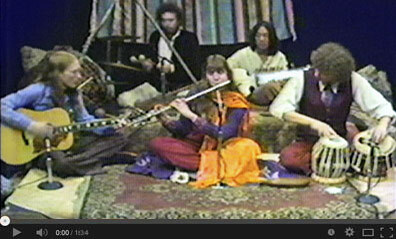 For world music aficionados, Ancient-Future.Com has a lot of valuable information, educational exercises, and streaming music and video, and now it is accessible on mobile devices! This huge in-house project has taken many hours away from precious music production time, and there are still a few projects left, including an expensive upgrade to the shopping cart to make it truly mobile friendly. But you can help to insure that music production gets the attention it deserves. 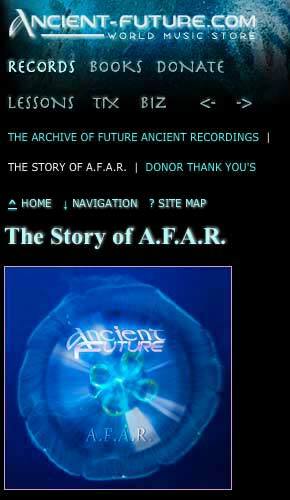 The fan funded Archive of Future Ancient Recordings gives supporters access to Ancient Future recordings as they are created. This summer, six new pieces and a video were added to the archive, bringing a total of 86 minutes and 51 seconds of music available to supporters immediately, with more to come as more money is raised! As many are aware, forces within the tech industry seeking to profit from free content have destroyed financial support for music by promoting the meme that free music is good for musicians, claiming that musicians would gain exposure and make money playing concerts. But now that even famous musicians no longer make money from their recordings, they have to be on the road most of the year to make a living. This has driven down performance fees and made it harder to book viable concert tours for unusual acts like Ancient Future. Ancient Future is dedicated to the idea that cross-cultural collaboration can help to create a better world, and now more than ever needs your help to continue to create world fusion music. Detailed information on the various supporter packages and the benefits included can be found at www.ancient-future.com/afar.html. A live medley of Prelude and Bookenka (The Adventurer), which was originally recorded on Ancient Future's Asian Fusion release, has been added to the Archive of Future Ancient Recordings. 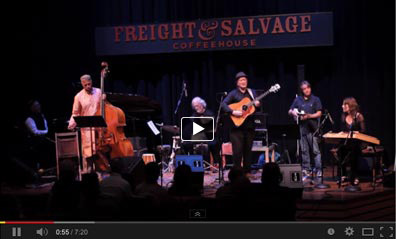 Fans can check it out on Ethnocloud at 720p now, and then get it in full resolution beautifully shot HD 1080p video and rich 96-kHz/24-bit audio as a thank-you for becoming a hi-res supporter of A.F.A.R.! 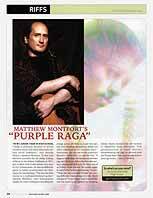 Guitar Player Magazine Feature on Matthew Montfort Plus Online Lesson (1.4 MB pdf). Matthew Montfort offers all styles and levels of guitar (and other plucked instruments) instruction as well as lessons on any of the subjects on the Ancient-Future.Com world music education web site via Skype. For further information, visit www.matthewmontfort.com or send an email to info@ancient-future.com. 45 Minute Skype Lesson. Normally $65. Sale $48. Buy 1 Now. 60 Minute Skype Lesson. Normally $75. Sale $60. Buy 1 Now. Ancient Traditions – Future Possibilities: Rhythmic Training Through the Traditions of Africa, Bali and India by Matthew Montfort (Ancient Future Music, 1985. ISBN 0-937879-00-2). Sale $52.95. Buy 1 Now. 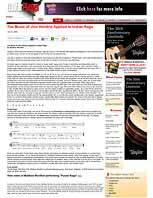 A must-have for all students of world music, plus there is an additional discount on a Skype lesson with your online purchase at Ancient-Future.Com! Save the dates of these important early 2017 shows! Tix: $24 adv., $28 door. Purchase tickets.